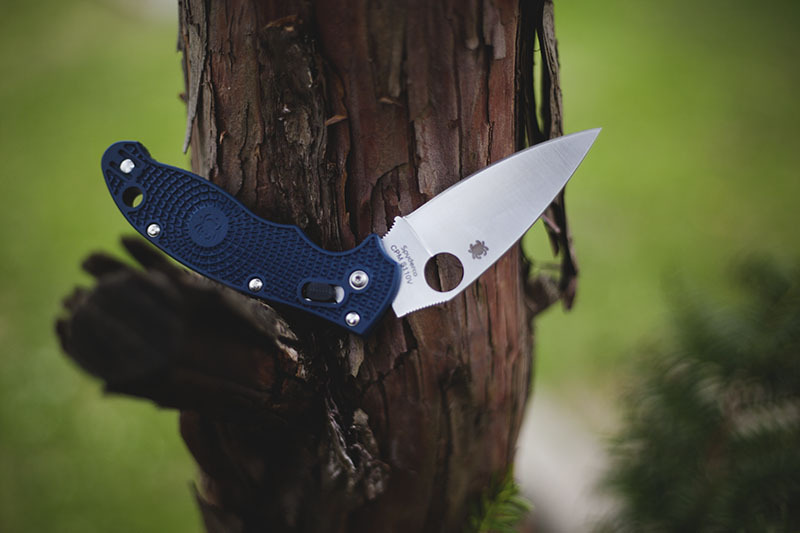 The Manix series of Spyderco knives have been a staple of the Spyderco line up for many years now. 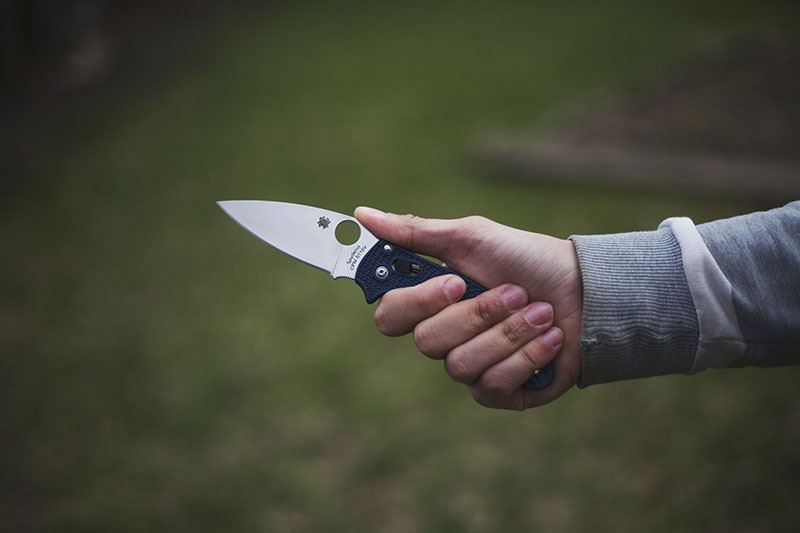 Originally conceived as a heavy duty workhorse with G-10 scales, steel liners, and a back-lock, the Spyderco Manix was reinvented in later editions as a lightweight model of the same proportions. 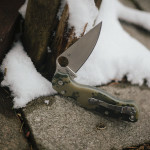 I have owned the particular version of the knife with the S110V and dark blue FRN handles since it came out, but I’ve been procrastinating on writing this review on it because, bluntly put, I’m more than a little disappointed with it (as a heads up – my disappointment is primarily with the handles; so if you’re considering getting the regular/G-10 version instead of the S110V FRN version that I’ve got, it’s safe to say that most of the qualms I have with this knife would dissipate). Now, let’s begin. A lot of my criticism of this knife won’t be apparent from the pictures. This knife is one of those that you have to see and feel in the flesh. 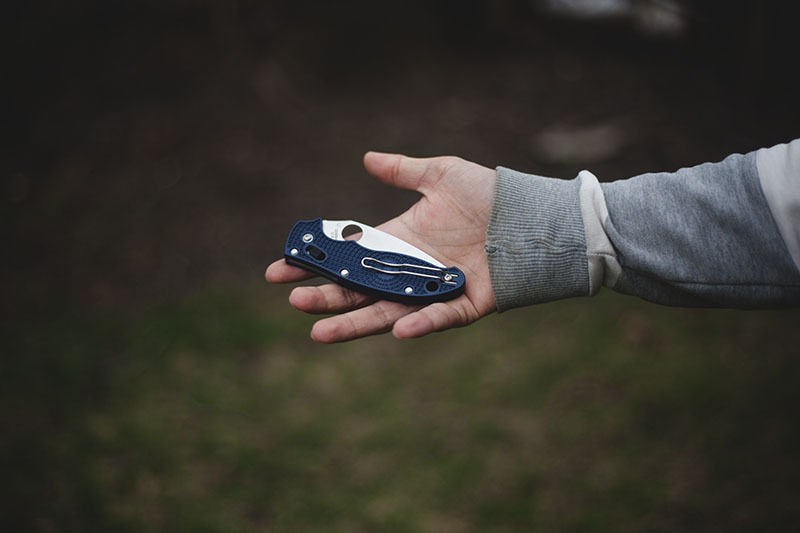 The Manix 2 FRN (again, not the G-10 version) has terrible ergonomics, which has to be felt in order to be truly understood. I will of course describe the issues as I see them the best that I can, but let me start by saying that if you’re thinking of getting my version of this knife, you likely shouldn’t order online. Go try holding it in-store to see if you can put up with the terrible ergonomics first. 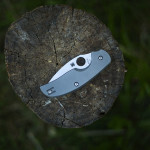 One of the few positives about the Manix 2 FRN is the awesome wire clip. It hugs my pocket, not too tight or too loose, but just right. It’s discreet enough to not advertise to the world that I am carrying a knife, which I always like in a clip. Besides the Spyderhole, the wire clip is actually my favourite thing Spyderco has come up with. That being said, the entire Sage series knives (Sage 1, Sage 2, & Sage 3), have these very same wire clips, so don’t go buying this knife just for the pocket clip. The 86 mm (3.7 inch) S110V blade on this version of the Spyderco Manix 2 is nicely tapered. 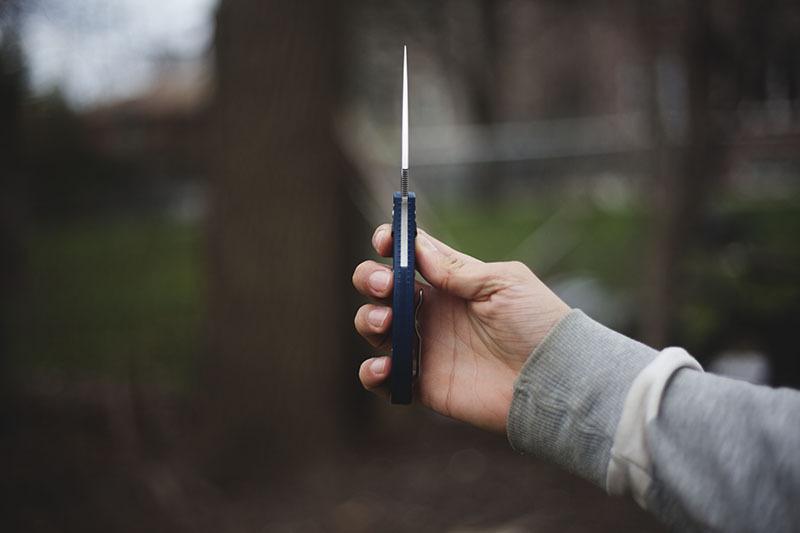 The tip is clearly overbuilt compared to the Delica or even the Endura, but for its intended purpose as a general workhorse, a reinforced tip is always a positive. The full flat grind is, as usual, very nice. I will say that in use S110V has not disappointed, even though past a certain point it does become quite hard to tell the difference between high quality steels like S30V and super steels like S11OV. 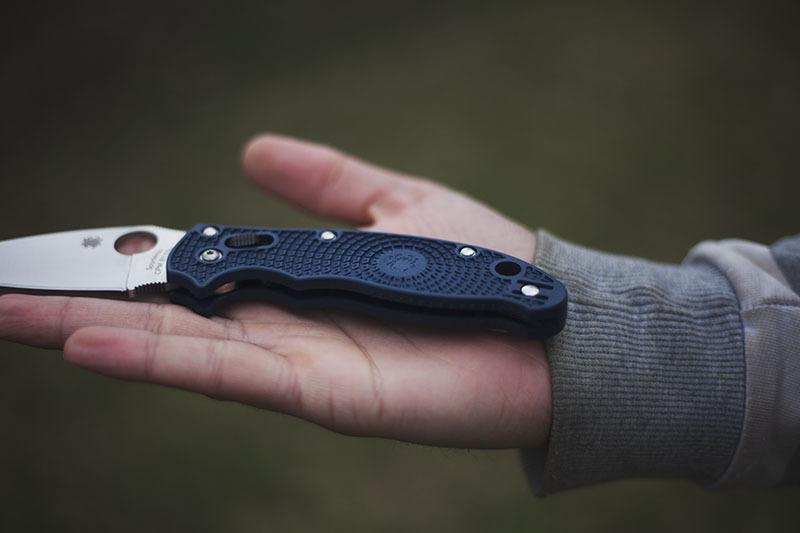 In hand the Manix 2 Lightweight feels extremely… well… lightweight! 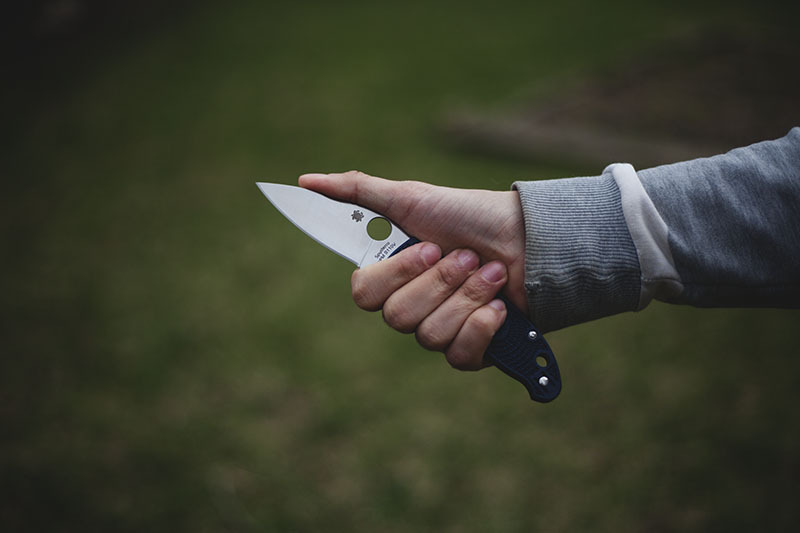 It’s shocking how bulky this knife is when taking into account that Spyderco managed to squeeze 204 mm (around 8 inches) of knife into a package weighing only 85 grams (around 3 oz)! Very impressive. Even more impressive is that the balance point is still relatively neutral. It’s obviously slightly biased towards the blade, as should be expected, but it’s nothing too extreme. 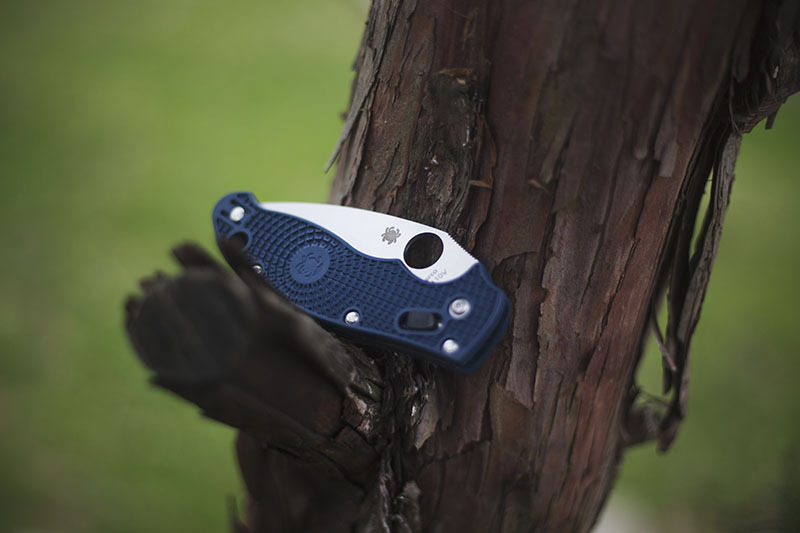 The Manix 2 features an almost fully pinned construction. Besides the pivot and clip, nothing is adjustable. I briefly considered taking this knife apart to check out that caged ball-bearing lock, but after 5 mins of trying, I came to the conclusion that unless you want to get the knife re-pinned, what you see is what you get. Speaking of the lock, I will say that it’s a marked improvement over the original ball bearing lock. I own the now discontinued Spyderco Dodo, and always found that the ball bearing lock, whilst technologically interesting and aesthetically cool to look at, was a giant pain to unlock. Heaven forbid you had gloves or sweaty hands! But the caged ball bearing lock fixes this difficulty by having a perfectly functional (if less pretty) slab of plastic over the ball which protrudes from the frame. This allows you to unlock the knife with incredible ease. 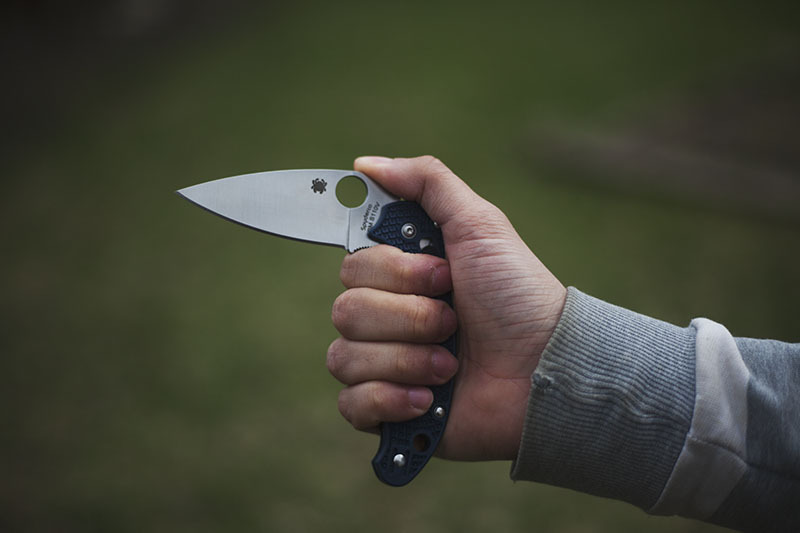 The Spyderco Manix 2 boasts a substantial choil, as many knives in the Spyderco line up do. Honestly, I’ve already compared it to the Sage series knives, but I’ll do it again: the Manix 2 is very reminiscent of a Spyderco Sage, especially in terms of aesthetics. 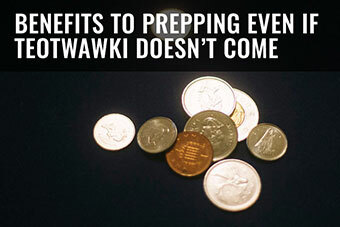 Deployment on the Manix 2 is scary fast, with very little friction or force required. The lock takes care of the detent. If you were wondering how Spyderco managed to fit so much knife in a 85 gram (3 oz) package, this is how: absolutely no liners besides the cage for the lock. With a chunky FRN backspacer, I noticed no flex or any rigidity issues which further confirms to me that liners are a waste of time and all knives should be built like the Spyderco Military with its shortened nested liners at the very most. Frankly most knives (especially those made of G-10) simply don’t require any liners and all that steel really adds up in terms of weight. 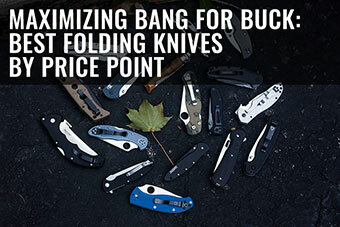 Good job on this move, Spyderco. And now for the crux of the critique. Sorry Spydie-lovers (myself included), this won’t be very pretty at all. 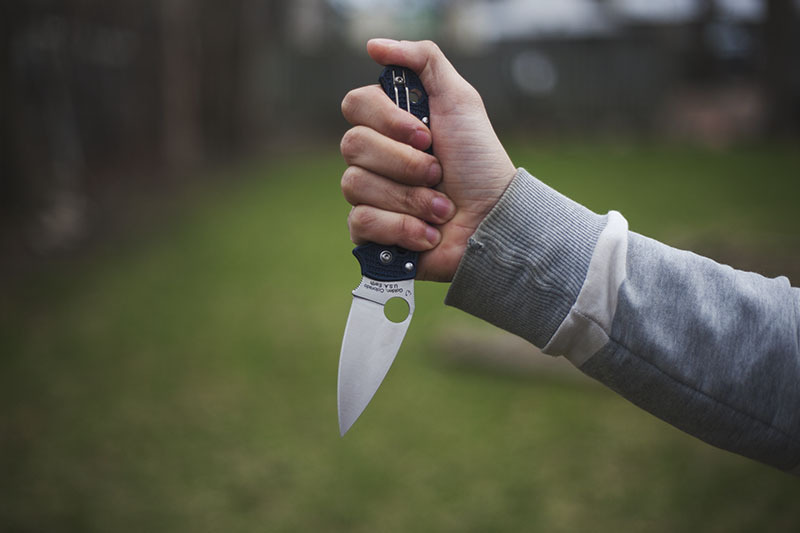 The ergonomics on the Manix 2 FRN are, simply put, atrocious. 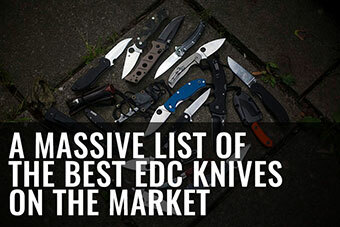 I can’t think of a single knife in my collection with such piss poor ergonomics. To say that these knife handles are ill conceived would be an understatement. When Elise first held this knife in her hands, she told me it looked and felt like a “lego knife.” Remember that sensation of stepping on little pieces of lego as a kid? Now imagine that feeling – but in the palm of your hands. The scales on the Spyderco Manix 2 FRN are basically slabs of plastic. There’s absolutely negligible contouring, and in practice, what this translates to is (even with all the curves and swoops) only a barely acceptable saber grip. 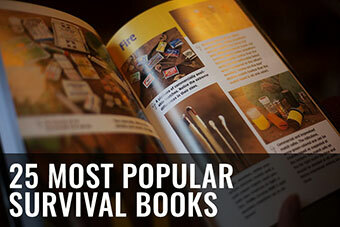 Now, again, this is obviously only true of the FRN version (the one I own). If you go with the regular, G-10 version, I daresay you’ll have a much better time with the ergos. Choking up? No thanks. Seriously I’ll pass. Reverse grip? Meh. Not feeling it. Pinched up? 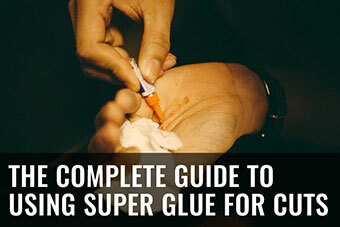 Unless your wearing gloves or have the hands of a lumberjack… no, this is not going to work out. The core issue at play is not me exaggerating how bad the ergonomics of the handles are, but rather having much better FRN handle options… from the same company… at a lower price. 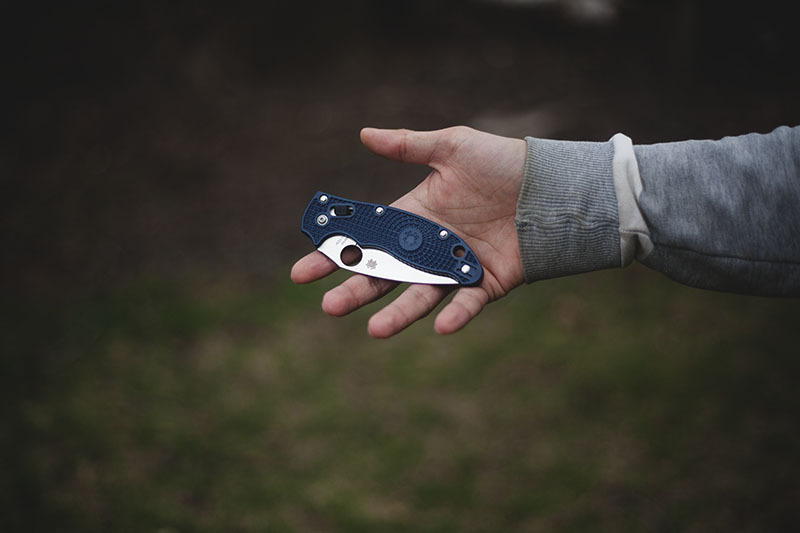 Why would anyone purchase the Manix 2 FRN after playing with a Delica? Or an Endura? Or a Stretch? 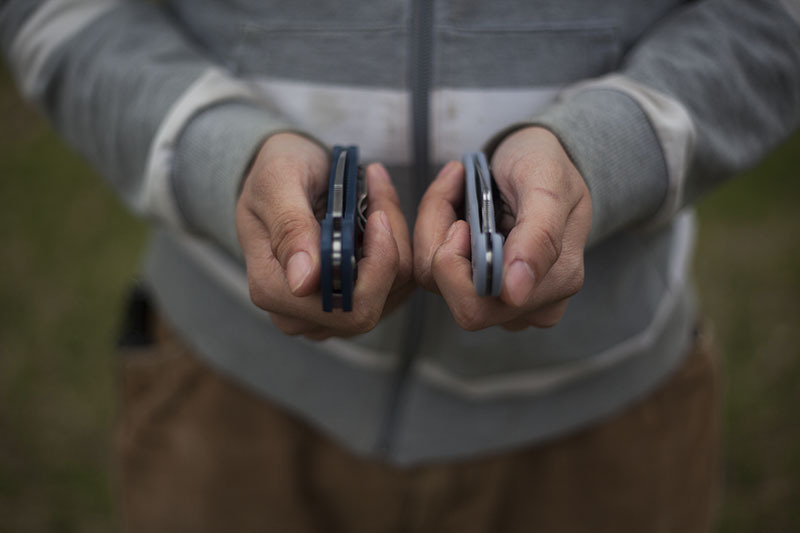 To hold the Manix 2 FRN and the Delica 4 side by side is like holding a primitive tool by a carefully crafted work of functional art. Sure, both cut and look pretty good, but one is actually nice to touch and enjoyable to use! 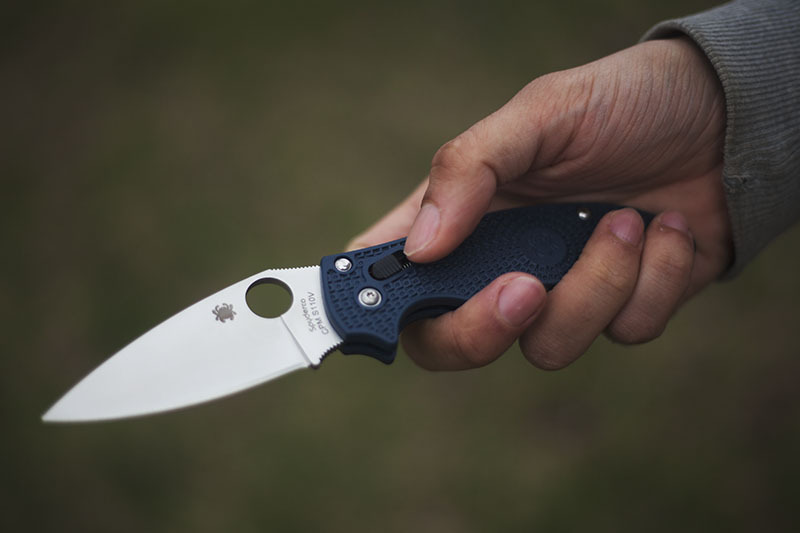 Besides the crappy ergonomics, Spyderco’s Manix 2 FRN suffers from mediocre injection molding of its FRN scales. It’s simply not as crisp, nor does it feel as high quality as the Japanese stuff. When I hold a Spyderco Delica I can see and feel that at $70, it’s worth every cent. I can’t feel that at all with the Spyderco Manix 2. 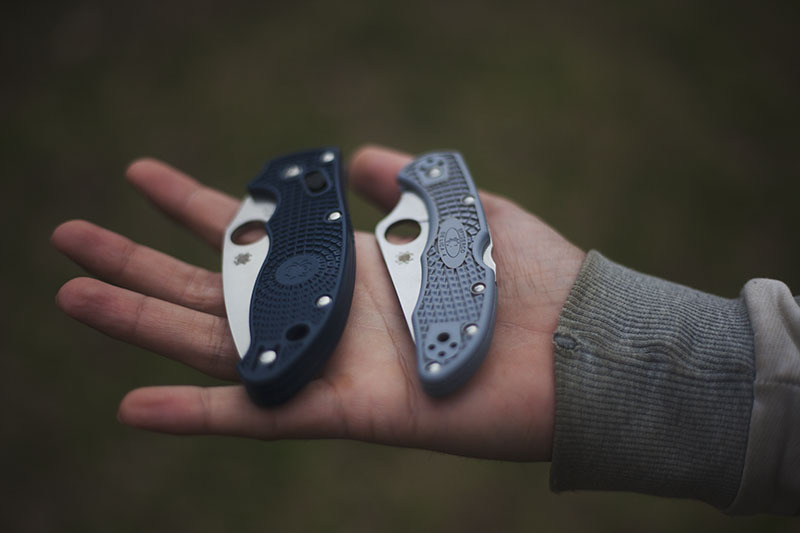 The picture below is by far the best picture I could use to to visually demonstrate how god awful the Manix 2 FRN scales are: just look at the difference between it and the Delica 4! The Manix 2 FRN is blocky, with quite sharp edges, while the Delica 4 is fully contoured, making it a dream to hold by comparison. 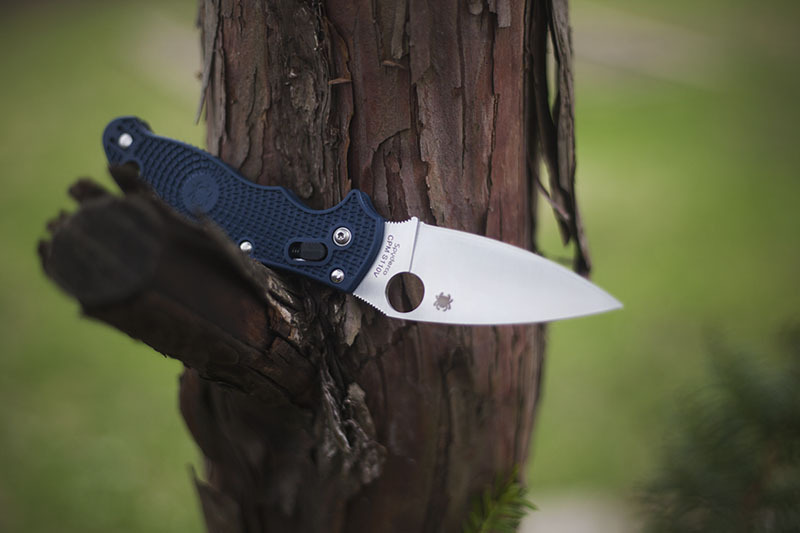 So while the Spyderco Manix 2 FRN might be a damn pretty knife, especially in pictures, I’ll admit, I find myself having to argue that it’s really not worth getting. 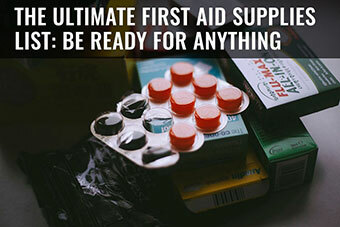 And if you do decide you probably want it: please, try it in-store first. You might not like what you feel. 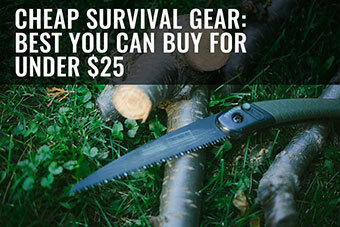 Objectively speaking, this knife looks like a steal. When I added the Manix 2 FRN to my collection, I honestly thought it would rise to the top as one of my favourite Spydercos, a hard feat to boast. At 86 mm (3.36 inches), a slab of S110V in a lightweight frame? Sign me up! That was my first thought. Yet it wasn’t at all that I expected it to be. I feel like the core issues with this knife would have been corrected if it was properly tested. 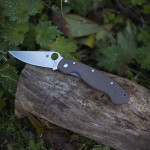 Spyderco is usually 100% on top of comfort and ergonomics, which is why this knife is more than a little disappointing. 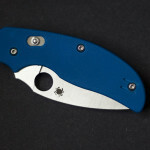 The Manix 2 FRN handles are blocky and poorly molded compared to any Japan-made FRN from Spyderco. Nothing on the handle is contoured, making the knife feel like it’s worth $30 (and even then I’m being generous). Yes, you do get a great steel if you pick up the S110V Manix 2, and for around $110 that’s pretty good, but when you hold a knife whose handles are so uncomfortable that the handles almost feel like they’re attacking you, you forget about the quality of the steel. My final advice: unless you’re going to drop some serious cash and get custom scales made, don’t bother buying the S110V Manix 2. 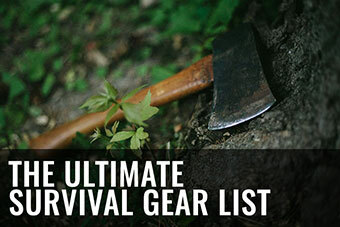 Either go for the G-10 version, or if you’re in it for the FRN, go for a Spyderco Delica or a Spyderco Endura. 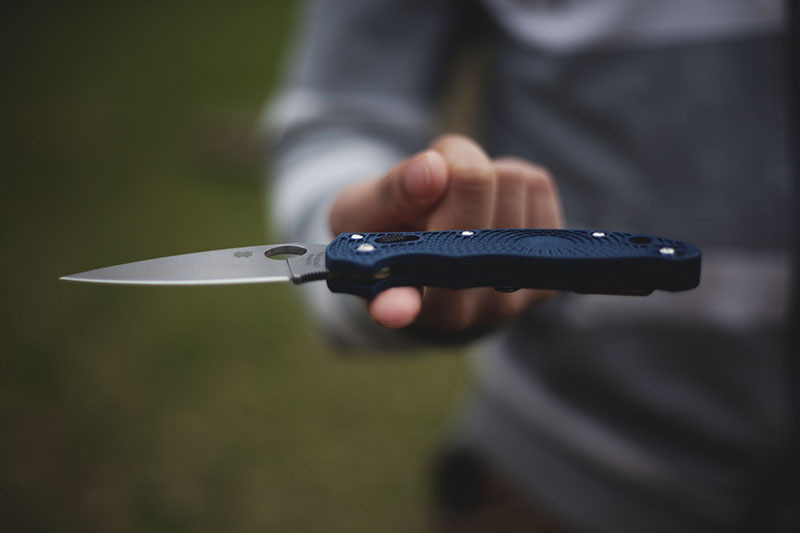 Still not convinced the FRN-handle Manix 2 isn’t for you? Try it in-store, please, before you buy it. Good choice ;) what the Para 3 instead of the Para 2? (just curious). 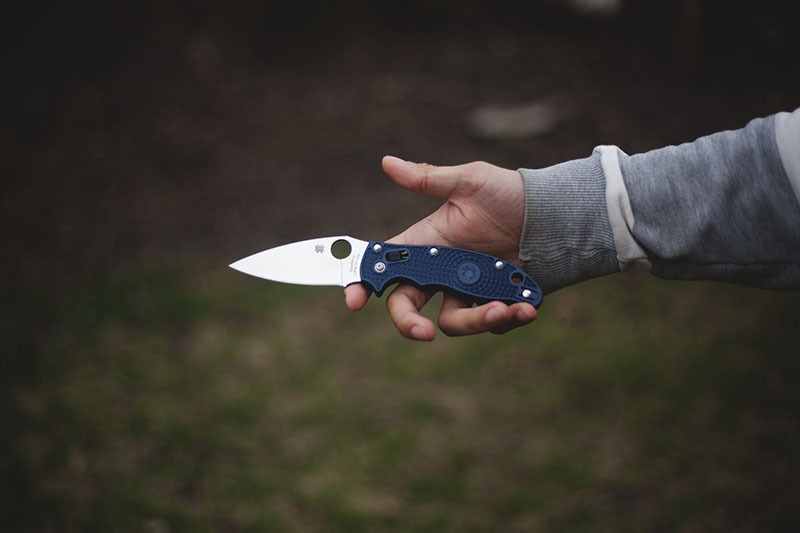 Have you reviewed the G10 Manix? 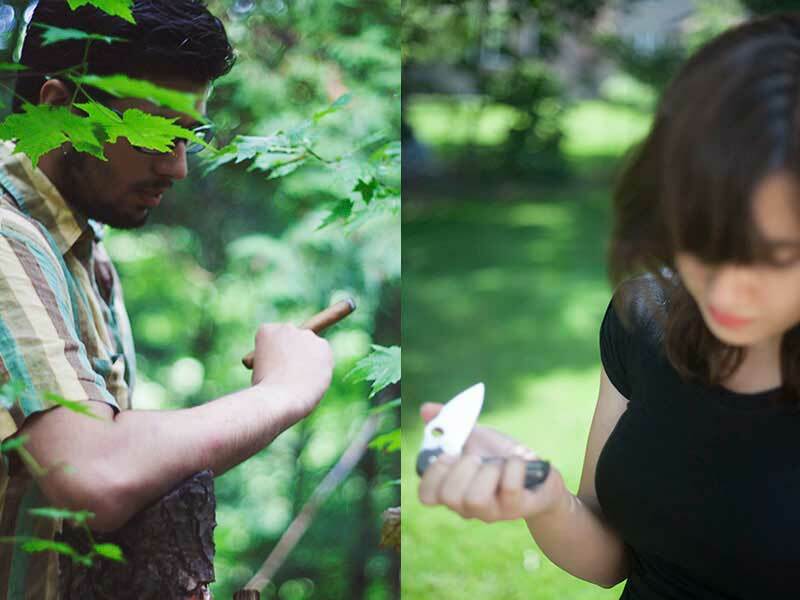 I’m considering one to trade off duties with my Paramilitary 2 as an edc (my job involves lots of hiking and some bushcraft). 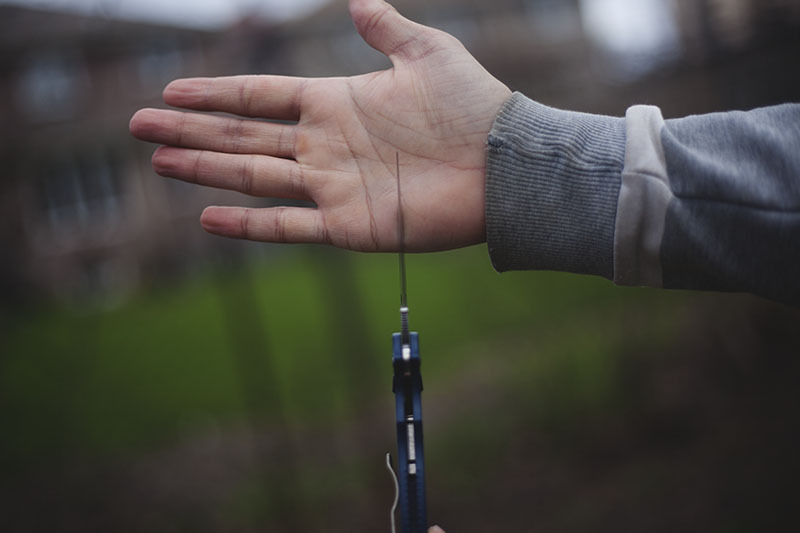 I like the idea of the Manix in that it SEEMS grippy enough to use in wet conditions and with gloves…but after reading your comments I’m wondering if too much grippiness can be a bad thing. 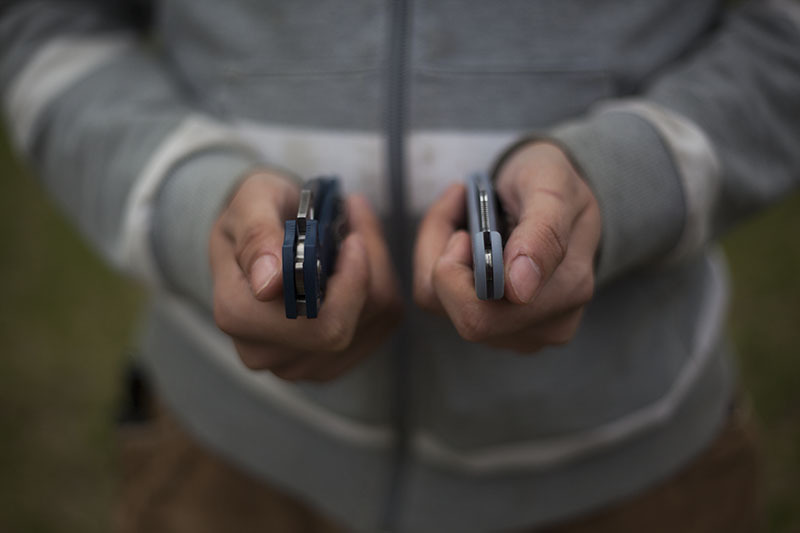 Have you used or held the G10 version? I would imagine the G-10 Manix would be a marked improvement. I don’t personally own it so I shan’t make any absolute statements. With that said, I reckon the G10 version will suit your needs just fine- the biggest issue I had with the lightweight version is the lego like ergonomics which don’t exist with G-10 due to a different, uniform texture and superior contouring. I’m a little late to the discussion, but just wanted to clarify something. I’m pretty sure all the LW Manix models are made of FRCP, which is not the same in composition as FRN. Aye! Different materials, in terms of practical application- FRCP is stronger and feels more rigid. Lower melting point compared to FRN though. Beyond that, the feel is very similar. Admittedly, I haven’t used my Manix LW very much but it hasn’t been due to the ergonomics, which I find to be pretty darn good. 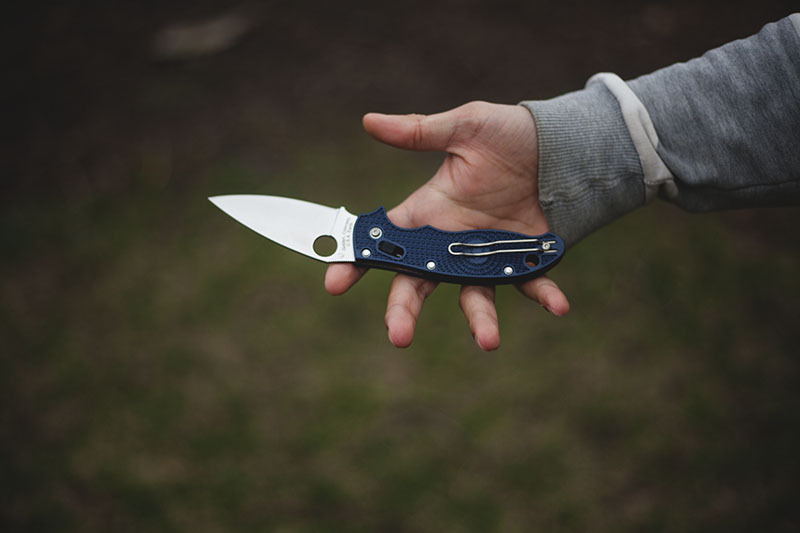 My main complaint with the Manix LW is the same I had with the original full size Manix from the early 2000’s–it takes up too much pocket space due to the massively wide profile. In the hand, the Manix in all incarnations works well but in the pocket it’s just takes up too much room. At least the LW model doesn’t weigh a ton. 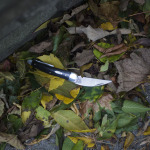 The other negative, in my opinion, about this knife is the abominable wire pocket clip. Yeah, the clip every reviewer praises. 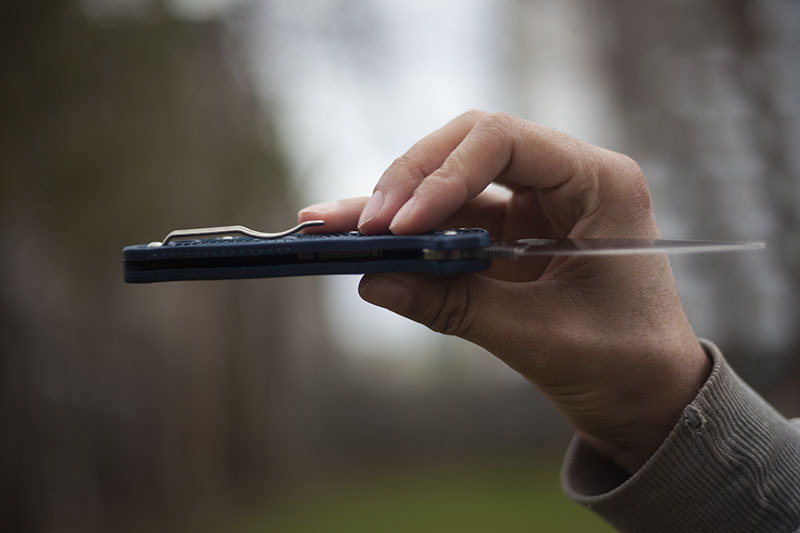 In my use, the thing flexes side to side so much I sometimes have difficulty removing it from my pocket by sliding it up by the clip–something I have to do at times when the pocket is tight or small in width. Unfortunately, Spyderco puts this egregious little wire on some excellent knives and offers no alternative. 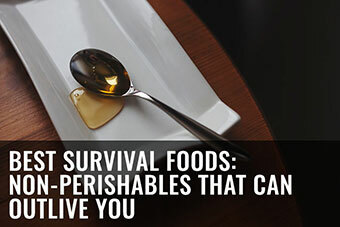 I just remove them and carry the knives in my back pocket. Or carry something else with a real clip. Interesting, I have never had issues with the wire clip flexing side to side and as you mentioned it does seem to be universally praised (including by me!). 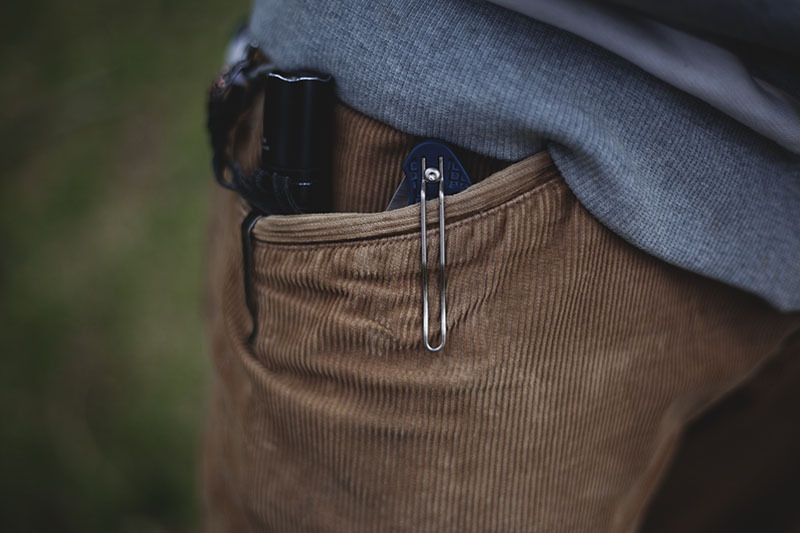 What do you prefer in terms of pocket clips? A well thought out write up. I will agree with you when you say the “Manix 2 FRN is blocky, with quite sharp edges”, but I don’t think the ergos are terrible. The Stretch, Delica, and Endura definitely have a much better feel than the Manix 2 (and Native 5 for that matter). But the ergos are still very good. The grip is very sure. The jimping on the handle is subtle; hell some guys file down the jimping on the G10 version. I think it’s the sharp edges that are the issue. I have the black manix 2 light weight with BD1 and I am having the opposite experience with ergos. Its right up there with my militaries and paramilitarie 2s. May hand slides past it easily when clipped in my pocket, yet it fills the hand and is very grippy. So light you dont know its there. 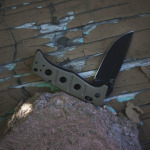 It may seem slender, but it is the same thickness as the military and paramilitary 2. Howdy Dave, my biggest issue was never the size or thickness but rather the lack of contouring. I guess I have been spoiled by all those 3d machined Kershaws and nicely curved injection molded Spydies like the Delica! Okay, I have never handled a Delica or an Endura so I checked out some pictures. I see what you are saying about the contours. For me ignorance is bliss or at least less expensive. Now when I go into my favorite knife shop I will be compelled to handle them. I can hear them calling my name now—Dave—Dave!—Dave!! Well – they’re still in-stock on Amazon: http://amzn.to/1jTSq5c. Though it says only 2 left so I guess they’re going fast! We’re not quite ready to sell ours yet. Thomas can’t stand it but I kinda love the way it looks ;). I think I am going to get one of those Delica 4 knives. I have been looking for a knife that I can carry that won’t take up to much room in my pocket but is easy to use and fits in my hand nicely. Any other suggestions? The Delica is an awesome knife for sure. 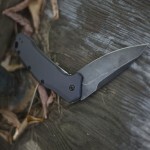 Other lightweight and comfortable knives would be the Sage 1 or the Paramilitary 2. I am thinking about getting a paramilitary also. I will probably get that digital camo one that i commented one earlier. Wow! I’m shocked to hear that you disliked the Manix 2 so much. I’ve got a G-10 version and it ranks as one of my favorite knives. 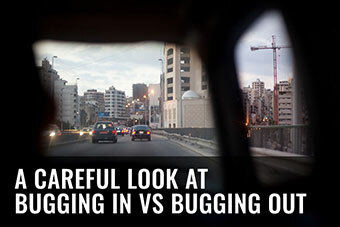 Value wise it gives ground to the Endura FFG (but what doesn’t?) but I actually like the ergos on it. I’ve got large hands (lineman hands are sort of like lumberjack hands) so maybe that is the difference. Even though you bashed one of my favorite knives, I really enjoyed your review. 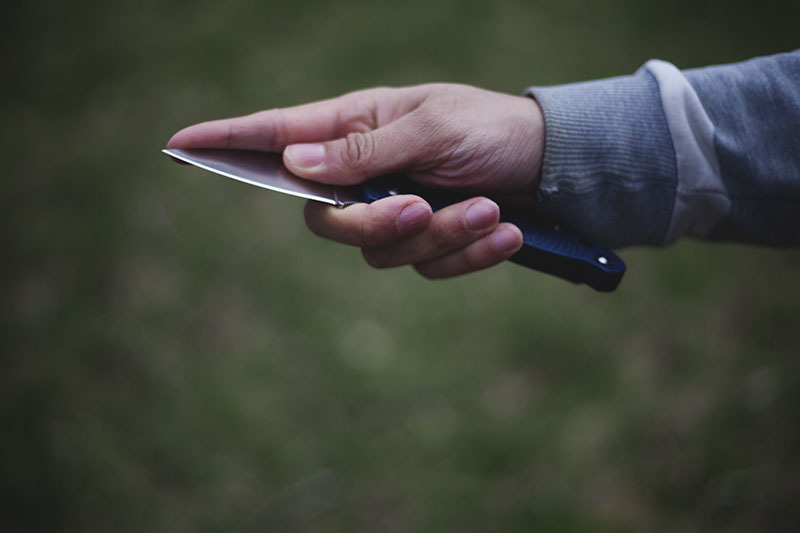 The flicking the knife open graphic was really cool. 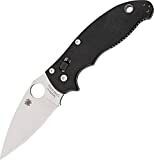 Honestly Mike I was shocked to write a negative review on a Spyderco knife too! Haha, in a lot of ways I am disappointed because Spyderco does and HAS produced superior knives and I feel it’s a letdown in terms of both fit and finish and comfort. It would have helped for you to clarify in the review that your negative experience was specific to the FRN handles and not the G10 version. 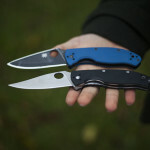 In the review it sounded like you were unimpressed with the overall shape of the handle which would be very controversial given the fact that the Manix 2 handles are EXACTLY the same shape and size as a Hinderer XM18. If you lay a Hinderer scale on top of the the Manix 2 scale the profiles are identical. That’s actually an excellent point – fixed now!